08/50 – At a mansion built by Sultan Abu Bakar, the Sultan of Johor in 1890. Today, the old fort at Labrador Park stands empty. A former shell of its past, it hardly gets a passing glance these days. But for Sean Cham, sites like this are ripe with imagery. In his mind, the 1942 Battle of Pasir Panjang plays out in vivid detail- the advancing enemy lines, the crack of rifles, the scuffling of boots as the soldiers dodge and duck amidst the crossfire. Armed with his camera, he poses like a soldier on the look-out, breathing life back into this forgotten site. “(These places) act as vessels of memories, where relationships are forged, stories created, and history is made,” he writes in the foreword to his series. 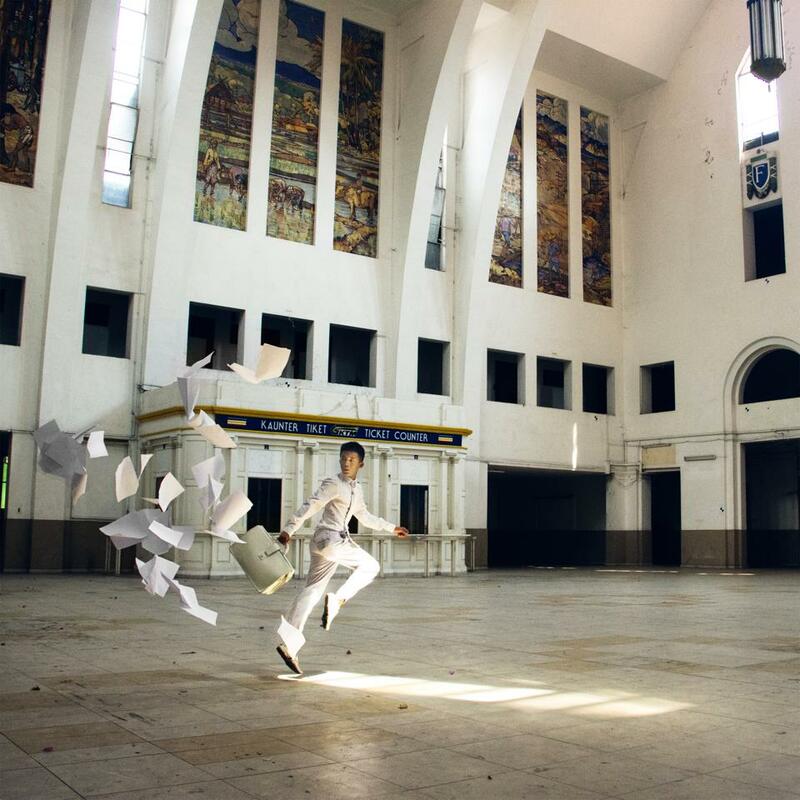 For the past six months, as part of his Yesteryears project, Sean has taken us on a journey from hidden palaces to abandoned swimming complexes to crumbling neighbourhoods and defunct railway tracks. 07/50 – An estate in Jurong built in the early 1970s by the Jurong Town Corporation (JTC). 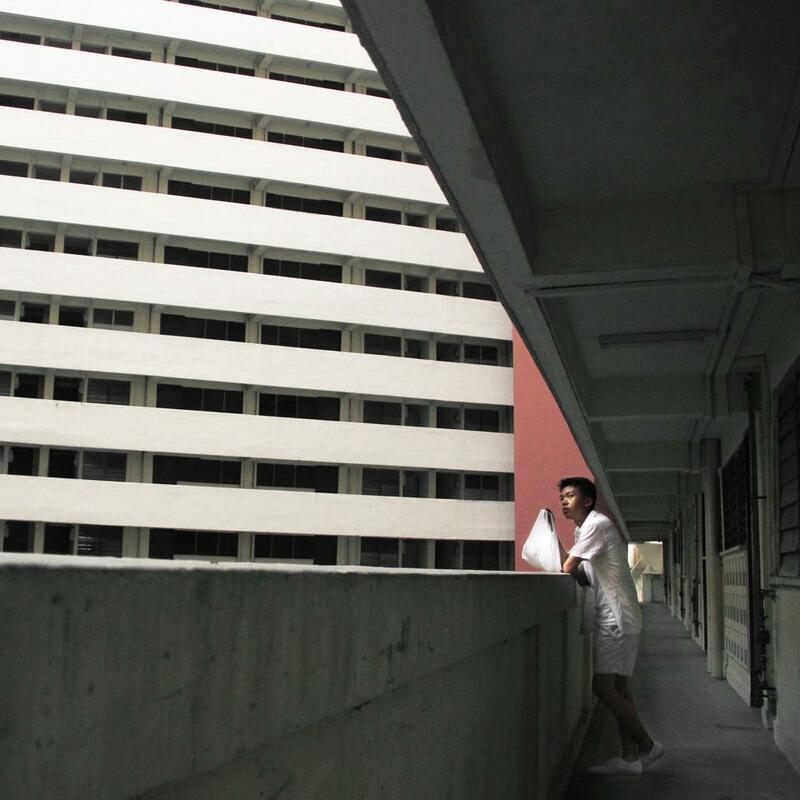 Last September, after finding out that his grandmother’s HDB block in Bukit Merah was going en-bloc, he became spurred to do something about it. “It’s kind of sad, when all these buildings are torn down. I just felt like something needs to be voiced out,” says the 21-year-old, echoing the sentiments of other Singaporeans who feel disorientated by Singapore’s rapidly changing landscape. Hence the Yesteryears project was born, with each carefully composed image forming tiny vignettes of the Singapore narrative. In one image, Sean poses stiffly in one corner of a grime-streaked, dimly lit green corridor, guised as a rabbit, while a sign in the foreground reads in yellow stencilled lettering “Yangtze Cineplex.” Located in Pearl Centre, this cinema opened in the 1970s and was one of the few to openly release blue films. The mall was also notorious for other vices like murder cases, or its massage parlours which reportedly provided sexual services. “The rabbit mask tells a story of the people that go there. There’s this veneer that they’re all pure and innocent, but they go to such (sleazy) places… and you know, rabbits are associated with being horny,” he gives a wry laugh. 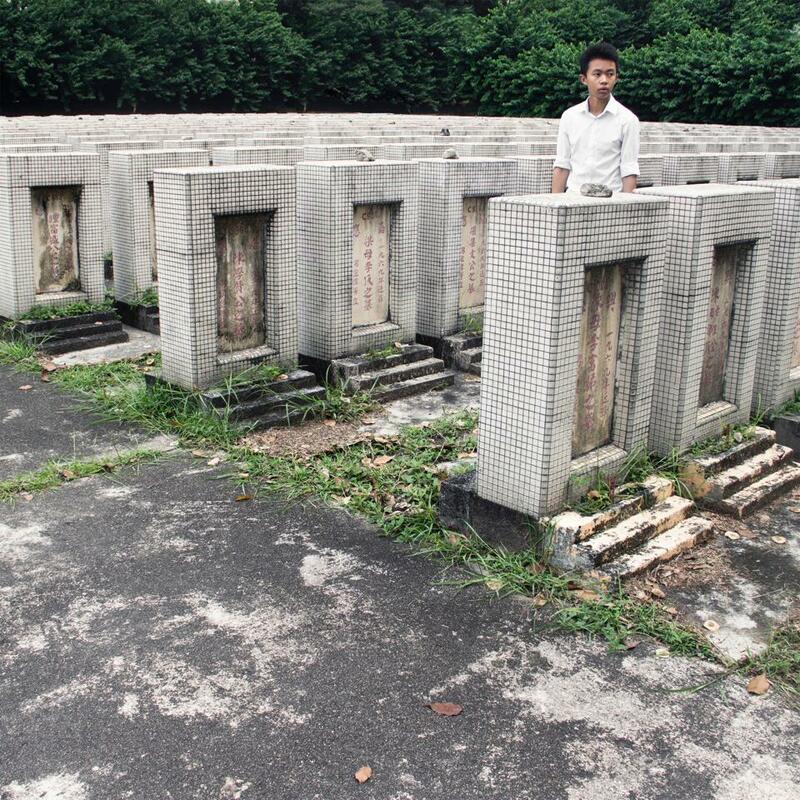 24/50 – The last Hakka cemetery in Singapore, home to 3,000 graves. 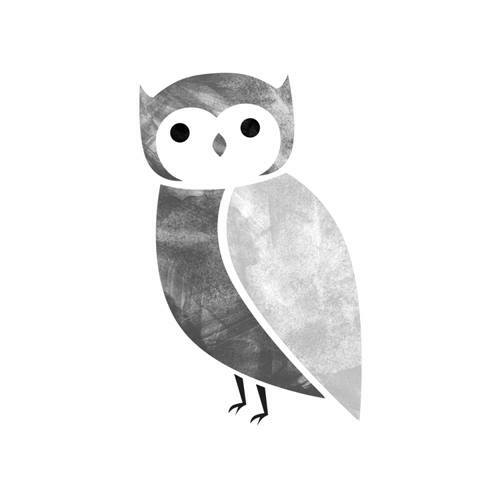 Other images are similarly abstract. In another picture taken at the now exhumed Bidadari Cemetery, Sean cuts a sinister figure, as he wields a long stick and dons a huge robe. It’s made more dramatic by a backdrop of sweeping, stark white cloth scattered on the grassy floors. 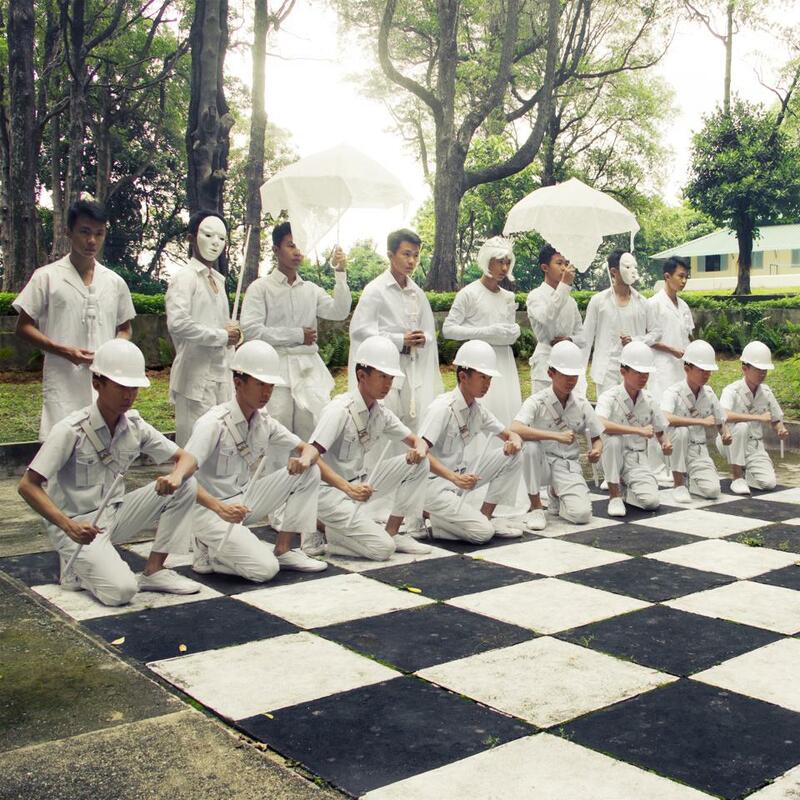 This time, he explains, the white cloth and mask symbolize the faceless spirits who have passed through Singapore’s largest, oldest cemetery. 31/50 – At St. John Island. It mainly served as a quarantine island from 1873 to 1943 before becoming a rehabilitation centre for opium addicts. The Yesteryears project thus becomes an exercise in nostalgia, going back in time to imagine life in Singapore’s early days. One of the most recent feature takes him to St John’s Island, where he poses on a giant chess board, drawing on the island’s dark past of holding hostages. Sean cites an interesting nugget of history. “The Japanese soldiers would use the prisoners of war as live chess pieces, and after that, they’d behead them. It’s an important fact in history but isn’t brought out everyday in our textbook,” he explains. He also mentions another similar project, “The Land of my Heart’ by local photographer John Clang, who re-appropriates the symbol of the iconic Singapore Girl (SIA) in the heartlands. With Sean’s roots in theatre and art during his junior college days, self-portraiture has become an irrevocable part of his oeuvre. Self-portraits help him become more “involved” as he explores and actively interprets what the place was like in the past, he says. To fit every landmark’s story arc, Sean tries to make each picture different. 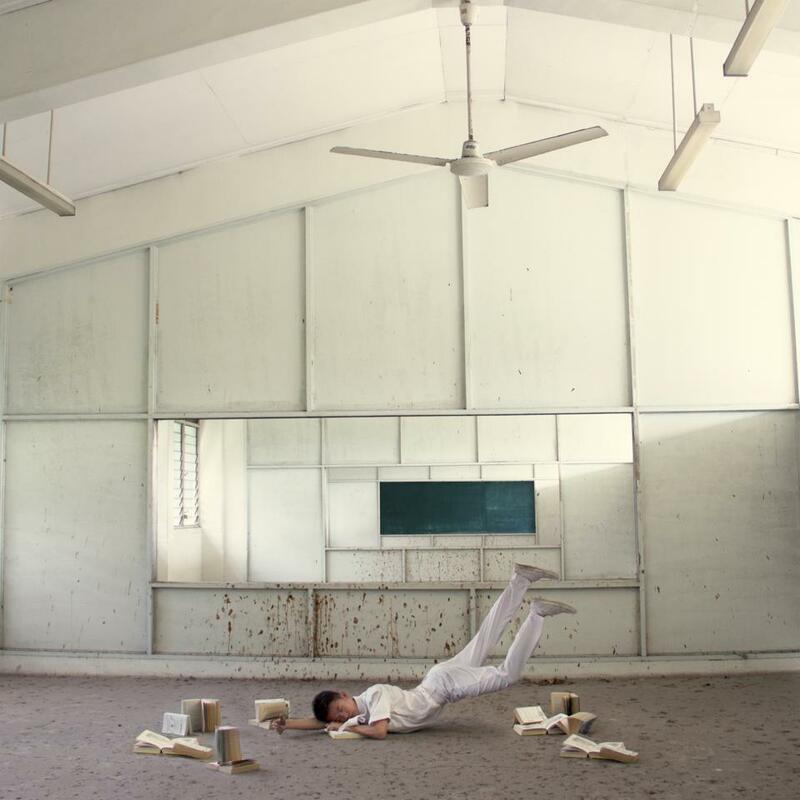 His various poses, whether it’s swinging from a rope in a school gymnasium, barely skimming his feet over the water as he sits on a boat’s edge at Lim Chu Kang jetty, or grappling with ghostly hands at Neo Tiew estate – speak of an effortless fluidity, of a dancer’s grace. “Maybe because I used be a gymnast?” Sean jokes. Drawing inspiration from acclaimed self-portrait photographer Cindy Sherman, he also tries to use “props and theatrics to tell a story” – resulting in an assortment of props like umbrellas, construction hats, and paper planes in his series. 01/50 – At the first civil airport in Singapore that opened in 1937 in Kallang. 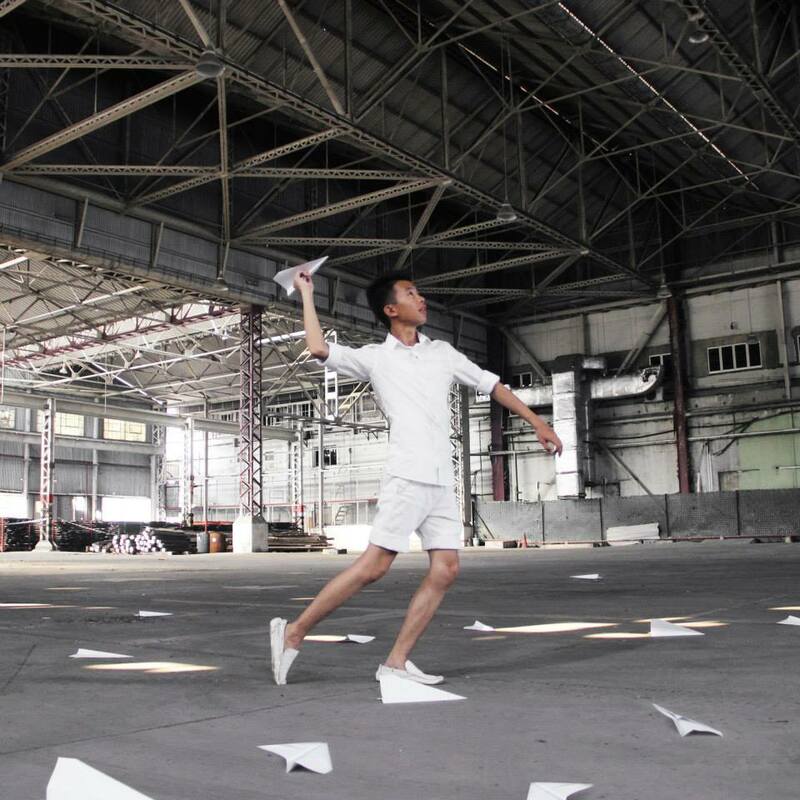 In addition, the colour white figures as a running motif across his work, be it in his all-white ensemble or props. People have accused him of advocating some political agenda, but he argues otherwise. 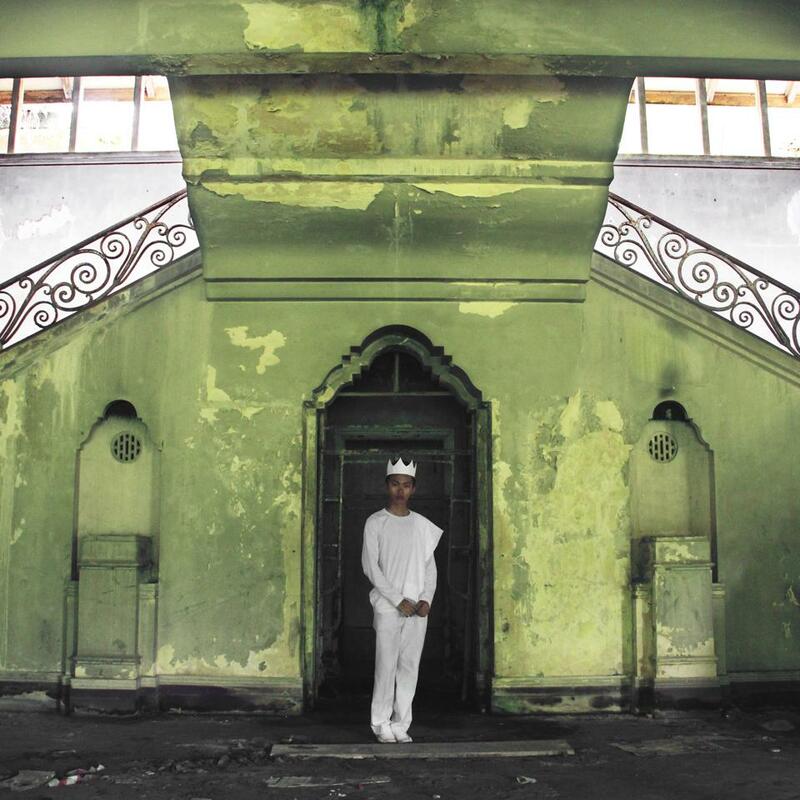 “I chose all white because I wanted it to be debased of any cultural reference, or any racial relations. It’s very neutral, very universal,” he explains. Thankfully, the series doesn’t get bogged down with trying to explain all this history. Instead, it plays on creating a tableaux teeming with atmosphere and mood, where the images act like still frames. 11/50 – At Tanglin Halt, one of Singapore’s first low storey flats built as part of a new satellite town. 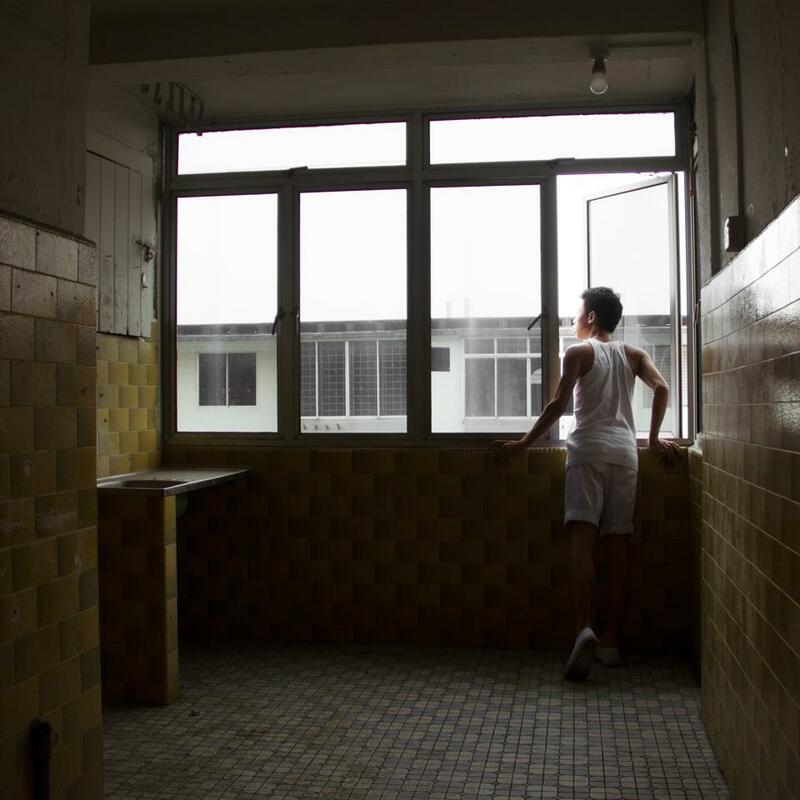 A personal favourite from the set is of Sean standing on tiptoes as he gazes out of the HDB block at Tanglin Halt. Somehow, the evocative image conjures up a sense of wistfulness and coming-of-age – it’s a scene lost in time. 23/50 – At the Tanjong Pagar Railway Station. The secret to finding these places? Research, says Sean, who gets ideas by looking at photos online, asking about his family’s childhood haunts, and suggestions from other Instagrammers. Then he sets off alone, traveling by public transport, with an extra set of white clothes in his bag. Going to some places aren’t exactly legal, he confesses, as he shows me an album on his phone titled “Legal”- the rest can’t be published. It must be challenging to conceptualize and vary each portrait, I ask, but Sean says the process is more intuitive than anything. He “feeds off the energy of the place”, creating spontaneous poses. Each shoot takes about one to three hours, as Sean has become used to the constant running to-and-fro in taking self-portraits. He admits that he still finds it daunting to venture to such sites. “It’s about the getting used to the whole abandoned, eerie feeling, entering an empty place… I go usually in the day, I’ll never go at night,” he says. 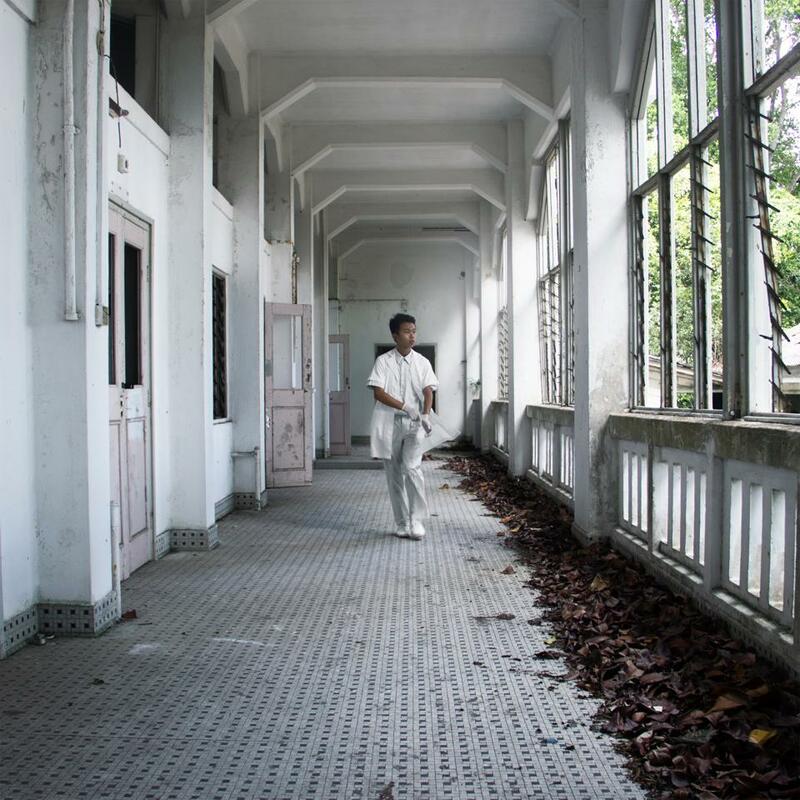 34/50 – At the old Changi Hospital, which has been closed to public since 1997. It served as a prison camp during WWII. Sean, who started this project for fun, had no idea that he would wind up to create an entire set of 50 portraits, let alone gain a huge following, including the likes of filmmaker Royston Tan leaving comments on his page. The national serviceman is currently focusing on completing the project in time for Singapore’s 50th birthday. With 32 pictures underway, the last image from the series will chronicle him going full circle. “For the 50th image, I’m going to shoot at my grandma’s place. It’s the grand closure, and it’s more personal for me, because that’s how I began the project and how I’ll end it,” he says. For all those who dismiss Singapore as sterile and boring, this Yesteryears series proves otherwise. “There’s more to (Singapore). Personally I feel that our nation is packaged very nicely and it’s very commercialized. It’s like a huge corporate plan,” says Sean, urging us to look beyond Singapore’s faux shine and glitzy glamour, and instead venture down paths less trodden to see it in a new light. Ee Ming Toh is a writer with Obscured.sg, a Singapore website with the intention of showcasing local artists across different genres to help foster a collaborative local arts community.